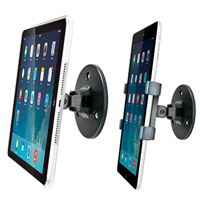 The Car Headrest Tablet Mount from Aidata is ideal for mounting a tablet to a car's headrest for back seat viewing (poles 55 to 185 mm). 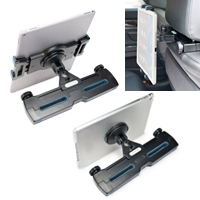 The universal clamp fits most car headrests, while the spring-loaded bracket (which holds most tablets from 7.9" to 13" can be rotated 360° and tilt adjustable to meet the specific viewing requirements of any user. The bracket features a quick release which enables users to quickly detach the bracket and tablet as a unit for portability without needing to remove the tablet from the bracket. The Universal Tablet Station Combo from Aidata is ideal for viewing a tablet whether at work or at home. This combination stand of heavy-weighted base or light-weight ring stand makes going from one set up to the next a snap (just snap in and out). The tablet attachment bracket has 360° of rotation and fits most tablets from 7.9" to 13". The Universal Tablet Wall Mount from Aidata is ideal for mounting a tablet to a wall, cabinet, desk, or any other flat surface (must be able to attach via 3 screws). 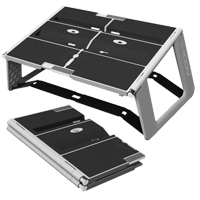 The spring-loaded bracket (which holds most tablets from 7.9" to 13" can be rotated 360° and tilt adjustable to meet the specific viewing requirements of any user. The bracket features a quick release which enables users to quickly detach the bracket and tablet as a unit for portability without needing to remove the tablet from the bracket. The Tablet/Document Holder for WorkFit-S from Ergotron is a simple accessory that adds functionality to the basic WorkFit-S models (ie. those without the upper worksurface). 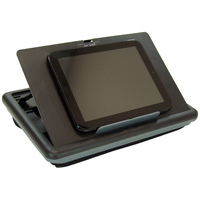 The holder is secured against the keyboard supports and positions the tablet or documents at a fixed angle for improved viewing. The holder will accommodate items up to 0.8" thick and has a surface 10.7" H x 7.25 W. It can support up to 2.2 lbs. 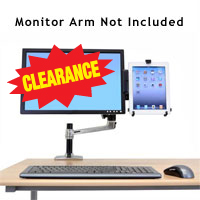 Note: When this accessory is added to the WorkFit-S the total weight capacity of the workstation is reduced by 1 lb. The Neo-Flex Desk Mount Tablet Arm from Ergotron will elevate many tablets and e-Readers to a suitable ergonomic viewing height. 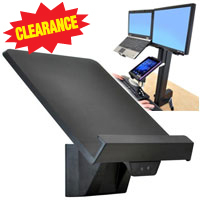 With a full 8" of height adjustment it can be used to position the middle of the tablet from 8" to almost 17" above the mounting point for optimum viewing while working at a desk. The elevation adjustment "locks" to ensure that the tablet screen remains stable when touch contact is made. To enhance the viewing experience it also features tilt and pan adjustments to fine tune the position to eliminate potential for glare from lighting. The convenient adjustable bracket quickly adapts to the tablet size and control positions and works with a wide range of tablets and e-Readers. To ensure secure placement the cradle latches into place while still permitting easy removal and replacement of the tablet when mobility is required. The Neo-Flex Desk Mount Tablet Arm can extend over 19" from the mounting point with the included extension or can be configured for an 11" reach without the extension where space is more limited. 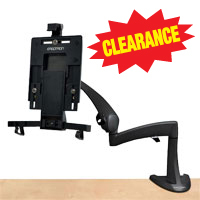 The Universal Tablet Cradle from Ergotron supports a tablet directly alongside an arm-mounted monitor. Utilizing the VESA mount, the cradle attaches using a sliding bracket that positions the Tablet Cradle to one side of the monitor. The convenient adjustable bracket quickly adapts to the tablet size and control positions and works with a wide range of tablets and e-Readers. To ensure secure placement the cradle latches into place while still permitting easy removal and replacement of the tablet when mobility is required. 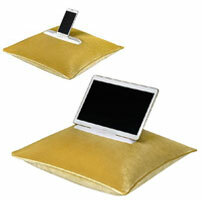 The Universal Tablet Cradle will work with monitors up to 24.5" in physical width. 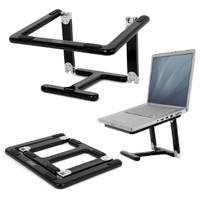 It is also possible to remove the sliding bracket and mount the Tablet Cradle portion directly to a VESA 75 or 100 monitor arm. The Astuto Ultimate Ultraportable Device Stand from iMoov provides laptop, notebook and tablet users with a highly portable universal stand that can be used to improve ergonomics virtually anywhere that any of these devices may be used. The unique design of the Astuto Device Stand provides improved ergonomics by elevating the device screen by up to almost 7" (on a desk or table) or slightly less when used on the lap or similar soft surface. This elevation reduces the risks associated with bending the neck for viewing screens that are placed below eye level. The convenient tablet/phone slots offer two preset angles, one for when actively working on the tablet or phone screen, or a second higher angle slot for use when primarily viewing content such as movies. The second slot has two thumbwheel adjusters that can be used to move the device to a steeper angle when desired. Elevating a notebook or laptop when being used in the lap enables the wrists to maintain a neutral alignment and reduce wrist extension. 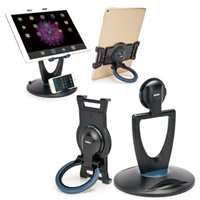 The Astuto Device Stand is designed for portability. When folded it takes up just 7.72" x 1.12" x 10.43" and weighs only 1.74 lbs, meaning it can be easily transported anywhere a device might be used. It can be opened or stored in less than 10 seconds and when unfolded doubles in width to 14.6". Sliding locking tabs create a rigid surface and the legs unfold and lock into position to ensure stable placement whether on the lap or desk. The flexible lap straps contour to the legs with the velvet underside ensuring grip and comfort even when used directly on the skin. The iMoov Teclado Bluetooth 3.0 Keyboard is a perfect accessory to the Astuto. This ultra-slim (0.26") rechargeable keyboard can be paired with up to three devices, ideal for users who work with multiple devices. It magnetically locks into slots on the Astuto Stand for use with a tablet or phone or can just as easily be used on a desk surface when using the Astuto Stand to elevate the screen of a laptop or notebook.